Despite the okay views, it was a good place to avoid the Teneriffe crowd. Seven to eight cars parked at the gate, but I figured most either went up Teneriffe or Mount Si through the connector. Rather than going through Teneriffe down to the saddle, the dogs and I traversed across the southwest face at around 4,000’ to the saddle instead. First time we were here was December of last year and the weather was not so kind. Bushwhacking and trail-breaking through thick woods wasn’t all that fun then. This time we were in for a surprise because someone (or some people) had chopped down some trees and revealed the trail in the section from 4,200’ to 4,400’. Amen and thank you to whomever it was! 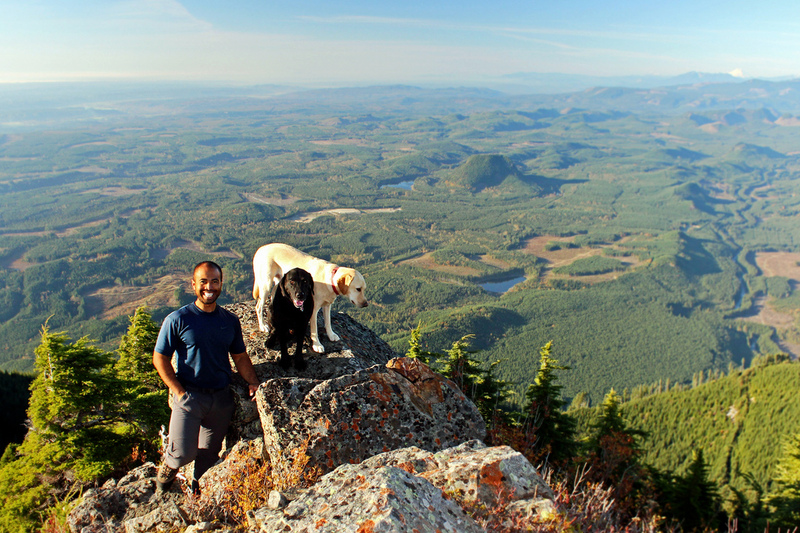 The dogs and I went to the north point just beyond the summit to get better views. From there we were able to get views of most of the Snoqualmie River Valley and views to the north. Views to the east and the south, however, were mostly obstructed by the summits of the Mount Si Natural Resources Conservation Area. Glad we took the Kamikaze Trail route rather than the service road, it saved a lot of time coming down and was way more interesting scramble wise.